Two rising stars in today’s firmament of Baroque music performance, Leila Schayegh and Jörg Halubek, join forces to record one of the major challenges in their joint repertory: the six Bach Violin Sonatas, BWV1014-1019. The collection’s title, 'Sei Suonate à Cembalo certato è Violino Solo', reflects the close partnership demanded of the violin and harpsichord players, with Bach moving away from the idea of continuo support for a solo instrument and constantly making new technical demands on the musicians, and thereby approaching the concept of the trio sonata. Completed by around 1725, most of these richly characterful works combine the Italian style and a cantabile tone with elements of German contrapuntal style. The artistic partnership of Schayegh and Halubek, now in its tenth year, has seen them record chamber music by Jean-Marie Leclair, CPE Bach and Giovanni Mossi but the Bach Violin Sonatas represents their first joint recording for Glossa. Leila Schayegh has been part of the recent much-acclaimed recording of Caldara Trio Sonatas, Op.1 with Amandine Beyer, as well as regularly having featured on many of La Risonanza’s Glossa releases. 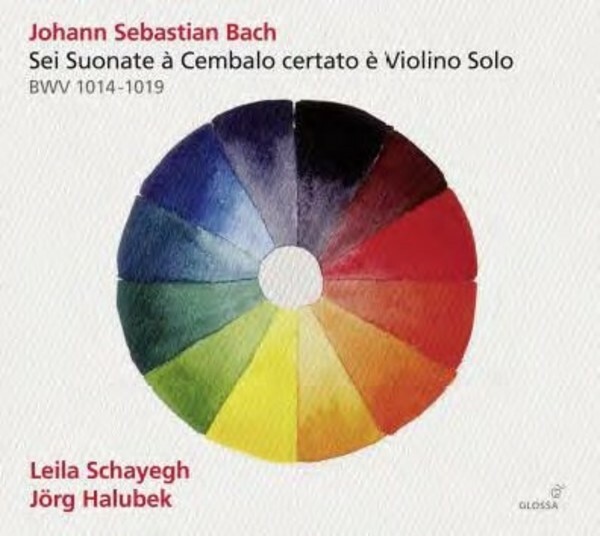 As Schayegh and Habulek mention in their shared booklet essay guiding the listener through the Violin Sonatas (and through the 12 represented keys which are also reflected in the set’s graphic design), they have added two movements from the earlier version of the final Sonata, BWV1019a, as a kind of cheerful and delightful encore.